With its prime lakeside setting, private boat mooring facility and luxury villa appeal, this 4 bed 4 bath villa in Valsolda offers an exclusive base for year-round Lake Lugano stays! Located along the main lake road, this beautifully-restored villa for 8 offers close proximity to a selection of authentic restaurants. The villa is also a short drive away from the well-serviced resort town of Porlezza (5 minutes), the idyllic charms of Gandria (9 minutes), the fashionable Swiss lake capital of Lugano (19 minutes) and the timeless shore of Lake Como (24 minutes). Internally, the 2-storey villa boasts a fabulous upper-level living room, with panoramic lake views and direct access out to a sunny scenic terrace. A swish new kitchen and elegant dining area for 8 offers every excuse to entertain, whilst outside a vine-covered terrace with stone-built BBQ provides the ultimate lakeside alfresco dining experience. The villa is ideal for couple-friendly stays too; with 2 Double bedrooms each with en-suite accompanied by 2 further Double Bedrooms and 1.5 shared bathrooms. The private lakeside garden promises pure escapism; with chic outdoor furniture, sun loungers and a day bed to enjoy lounging on, whilst the breath taking lake gently laps against the shore. A private boat mooring facility and parking space also feature. Perfect for carefree lake breaks, the luxury villa is situated just 31 minutes’ drive from Lugano Airport and 80 minutes’ drive from Milan Malpensa. The luxury villa is perfectly-suited for group getaways and family stays. For an additional charge, baby cots and adult single camp beds can also be provided. The luxury villa further benefits from private laundry and ironing facilities, free WIFI, SAT TV. Air conditioning, channels, a hairdryer, universal shaver plug and cosy central heating. In total, 26 external steps feature to the property. Please note that the villa is unsuitable for infants and the elderly. A private parking space and a private boat mooring facility feature with the property. Situated along the lakeshore, the timeless villa surroundings place guests within easy reach of the authentic Italian restaurants, the historical charm of central Valsolda and also the breath taking Valsolda nature reserve (1-9 minutes’ drive away). Valsolda offers close proximity to the family-friendly resort of Porlezza, 5 minutes’ drive away (for supermarkets, shops, restaurants, horse riding centres, water sports, the Porto Letizia resort park and its facilities). Just 6 minutes down the road in the other direction leads to the FAI Villa Fogazzaro ROI attraction, whilst 3 minutes on leads to the quaint historical lake village of Gandria (the starting point for the scenic Olive Trail). 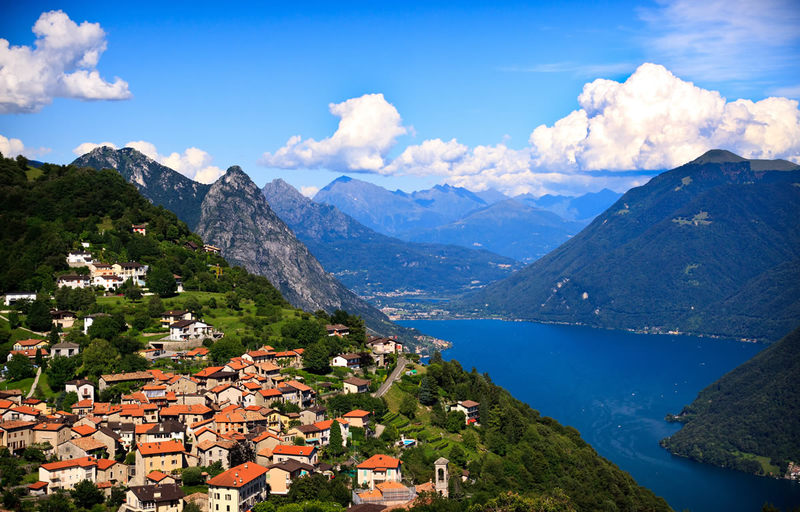 Lugano city is within easy reach too, just 19 minutes’ drive/ bus ride away. Here guests can soak up the modern lakeside centre, designer shopping boulevards, museums, art galleries, casinos and nightclubs, as well as its antique shops, traditional markets and timeless holiday activities. Popular attractions here include the Parco Civico, the Museo Civico di Belle Arti, Museo Cantonale d’Arte, the Museo Cantonale di Storia Naturale, the family-friendly Lido di Lugano, the tennis club and Cattedrale di San Lorenzo. Lugano’s charming cafe-lined piazzas, idyllic lakeside promenade, panoramic vistas and scenic boat trips also provide an added dose of Italian-style romance too; for a truly unique and dynamic Swiss lake city experience. Lugano is well-connected by ferry, bus, road, train and airport links (Lugano airport is just 31 minutes’ drive away). The city is also home to the popular Lugano Golf club and offers easy access to nearby hiking trails, such as Monte Bré. Valsolda also offers close proximity to Lake Como (Menaggio is just 24 minutes’ drive away) and the popular international airport of Milan Malpensa (80 minutes’ drive away).